Also Disney Studios discovered the power of E.T.A. Hoffmann’s classic tale and made a movie called NUTCRACKER AND THE FOUR REALMS. Directed by Lasse Hallström, Joe Johnston, starring Keira Knightley as the Sugar Plum Fairy, Morgan Freeman as Drosselmeyer, Mackenzie Foy as Clara, Helen Mirren as Mother Ginger and last but not least, the outstanding world known Primaballerina of American Ballet Theater, Misty Copeland. Let the teaser enchant you too. In cinemas since November 2018! Dec 21st 2017 by I.M. THE story of a little girl at Christmas, her toy nutcracker and their adventure in a kingdom of sweets has become an institution. This winter, a version of “The Nutcracker” will be performed on every continent (Antarctica aside). In London alone, there are three major companies and productions to choose from; in America, where “The Nutcracker” can generate up to 45% of a ballet company’s annual revenue, you can see at least one version in every state. Since 2007, “Battle of the Nutcrackers”, an American programme, has pitted international companies against each other. “‘The Nutcracker’ is one of those quintessential Christmas events” says Melissa Hamilton, a first soloist at the Royal Ballet. All this from a rather flat-footed beginning. E.T.A. Hoffmann, a Prussian gothic-horror writer, had provided the kernel of the story in “The Nutcracker and the Mouse King” (1816), but it was the lighter and more child-friendly version written in 1844 by Alexandre Dumas, a French novelist, that was turned into a two-act ballet. The first act portrays a Christmas party at which Clara receives an enchanted nutcracker from Drosselmeyer, her magical toy-making godfather. That night, after battling a mouse king the nutcracker becomes a prince and takes Clara to the land of sweets. In the second act they meet the colourful denizens of this candy kingdom, most notably the Sugar Plum Fairy. After the success of “Sleeping Beauty” in 1890, Marius Petipa and Pyotr Tchaikovsky were commissioned to do the choreography and music; when Petipa fell ill, Lev Ivanov, his assistant, stepped in. Petipa had given Tchaikovsky detailed instructions on what kind of music would be required for the dances. He wanted the Sugar Plum Fairy to sound like “drops of water shooting from a fountain”, so Tchaikovsky incorporated the “heavenly sweet sound” of the celesta, a new instrument that sounded like bells (Tchaikovsky detested some of the music he had written, but it went on to become some of his best known and loved). When “The Nutcracker” premiered in St Petersburg on December 18th 1892, the production as a whole was not well received. The music was considered a success, but it was criticised for its strange plot and seemingly unconnected scenes “recalling the latest pantomimes”, its reliance on spectacle and the dominance of children’s roles. Subsequent productions have attempted to address these criticisms. In 1919 Alexander Gorsky, a Russian choreographer, combined the roles of Clara and the Sugar Plum Fairy, and made the story a romance. In 1934 Vasily Vainonen went further, making the whole thing Clara’s dream in order to explain the fantastical events. The key elements of the story are still up for grabs. How the story ends, and even Clara’s name, varies from production to production; some have preferred Maria, Hoffmann’s original choice, or Masha, a Russian moniker. The production that is credited with lifting “The Nutcracker” to new heights is George Balanchine’s for the New York City Ballet. It was not the first to come to America, but is by far the most famous and was the first in the world to be telecast. It has been performed in New York every year since its premiere in 1954—indeed, “George Balanchine’s The Nutcracker” has since been trademarked—and is also performed by six other companies around the country. 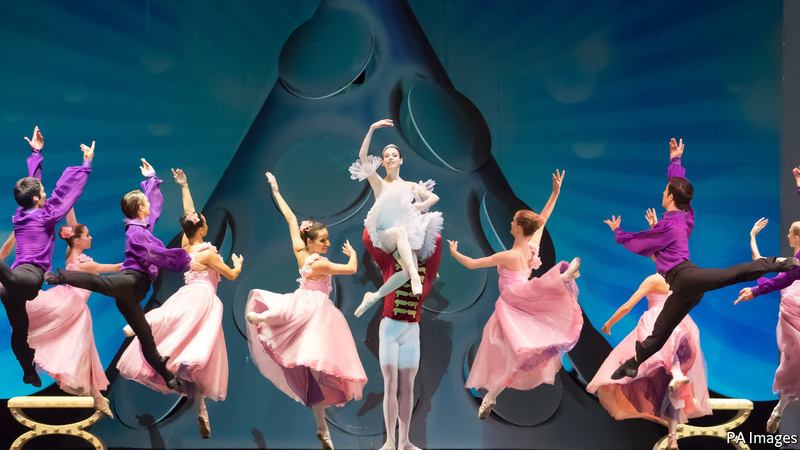 The Balanchine version may have offended early critics of the spectacle: it is undeniably saccharine, featuring 150 costumes, a large cast of children and a Christmas tree that stands at 41 feet and weighs a tonne. In the latter half of the 20th century, the nutcracker factory went into overdrive. Rudolf Nureyev and Yuri Grigorovich choreographed productions for the Royal Ballet and the Bolshoi in the 1960s. American Ballet Theatre and Pacific Northwest Ballet got their renditions in 1976 and 1983. Sir Peter Wright’s landmark production for the Royal Ballet in 1984 is still being used today with Sir Peter, at 91, still coming in to make tweaks and changes. The ballet’s exposure has only increased further with the advent of live streaming. Over 1000 cinemas in 50 cities broadcast the Bolshoi ballet’s Nutcracker in 2016. Part of the tale’s appeal is obviously its setting: audiences respond to the romantic ideal of a huge Christmas tree, snowy landscapes, sweets and presents. But the ballet’s adaptability to different cultural contexts has led to a global appreciation. China’s National Ballet premiered their take, called “Chinese New Year”, in 2016; it features a Crane Goddess instead of a Sugar Plum Fairy, and dragons instead of mice. In 2014, the Joburg Ballet created a uniquely South African version set in the Kalahari desert—it incorporates elements of local dance and circus arts. In December 2017, Ballet Hawaii is bringing back their version of “The Nutcracker” set in the 1858 Kingdom of Hawaii. The “Snow Scene” takes place on the summit of Mauna Kea; the “Waltz of the Flowers” features hibiscus, orchids and crown flowers. Septime Webre, the choreographer for Ballet Hawaii, says that “the language of ballet is metaphorical rather than literal” and this goes some way in explaining why “The Nutcracker” has proved to be so versatile as “a context and backdrop for the dreams of a young girl who comes of age”. But it is also because since the very beginning, adaptation has been part of its story. The template has allowed for endless innovations over the ages, but it is also a generator of tradition, with the best ideas rewarded by being used again and again. “The Nutcracker” started out as a poorly-received Russian ballet. Since then, it has been tweaked, honed and reinvented, becoming the perfect fabric onto which Christmas dreams are stitched.